Blood is a complex fluid in which the presence of the various constituents leads to significant changes in its rheological properties. Thus, an appropriate non-Newtonian model is advisable ; and we choose a Modified version of the rheological model of Phan-Thien and Tanner (MPTT). The different parameters of this model, derived from the rheology of polymers, allow characterization of the non-Newtonian nature of blood, taking into account the behavior of red blood cells in plasma. 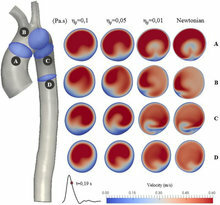 Using the MPTT model that we implemented in the open access software OpenFOAM, numerical simulations have been performed on blood flow in the thoracic aorta for a healthy patient. We started from a patient-specific model which was constructed from medical images. Exiting flow boundary conditions have been developped, based on a 3-element Windkessel model to approximate physiological conditions. The parameters of the Windkessel model were calibrated with in vivo measurements of flow rate and pressure. The influence of the selected viscosity of red blood cells on the flow and wall shear stress (WSS) was investigated. Results obtained from this model were compared to those of the Newtonian model, and to those of a generalized Newtonian model, as well as to in vivo dynamic data from 4D MRI during a cardiac cycle. Upon evaluating the results, the MPTT model shows better agreement with the MRI data during the systolic and diastolic phases than the Newtonian or generalized Newtonian model, which confirms our interest in using a complex viscoelastic model.